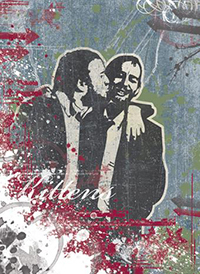 The Kittens is a lo-fi folk band lead by former Divine Comedy bassist Bryan Mills and Nick Munro. After Bryan left Enniskillen for the University in Edinburgh, he met Nick in a basement tavern in Edinburgh’s mirky Old Town where Bryan regularly sang. Soon after the band actually saw the light, and eventually Ivor Talbot (who also played with Bryan in Lady Macbeth) joined them. But after leaving University, Bryan moved to London and became a permanent member of The Divine Comedy. After a 8 years hiatus but still exchanging cassettes or doing recordings over the phone, the bands reunited after Bryan left The Divine Comedy in 2002. They called themselves The Kittens and released an EP, Tiny Motions. With the help of Nick Munro’s label Alfonzo Records, they played regularly in London in 2002-2006. They started recording sessions with Robin Guthrie (Cocteau Twins) and violinist Fiona Brice (Jack, Placebo…), but nothing was released afterwards. Eventually, a couple of songs from their debut EP went released by Stolen Recordings and Fantastic Plastic Records. In 2008, a new line-up composed of Bryan Mills (guitar, accordion, vocals), Nick Munro (melodica, guitar, glockenspiel, drums), Jon Simcox (casio, drums), Matthew Hicks (bass, drums, melodica), Lucy Munro (backing vocals), Jennifer Lewandovski (backing vocals, harmonica), ‘Cousin’ Simon (backing vocals) played in Portugal and started recording an album in a cottage in Morvern, Scotland. But then again, the project never went finished, and the band went into a new hiatus. In 2011, the band reunited again, playing some gigs at the Union Chapel in London, and also supporting Emmy the Great & Tim Wheeler. In 2014 the band contribute the song ‘Jupiter And Mars’ for the soundtrack of the film Slow West (2015) by John Maclean (ex-Beta Band); in the movie Bryan Mills also plays a character.